Best rally moment: Grizedale stages 2013, we needed to make up over a minute on the final 18mile stage to clinch the overall title and we managed it. Worst rally moment: Crashing at Rockingham on 1st stage of a 2day event. John and his car competed in a few small events in 2012. In 2013 John and Chris (his co-driver) entered to do the full ANCC mixed surface championship, their first in competition and with a relatively new car. 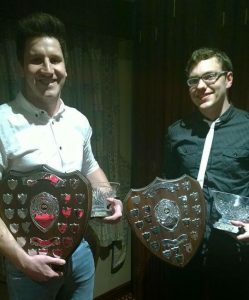 After 10 events on gravels and tar they won their category and were crowned ANCC Overall Champions (both Driver and Co-Driver). Following the success in 2013, the next few years were quiet on the competition front. Upgrades and developments to the car, however, still continued. In 2016, the car/team, known as “ZR-TEC” returned with a stronger and faster car to use on selected national events and achieved some fantastic results including a 14th O/A, 1st in class and 1st FWD car on the Imperial Commercials Donnington Park event. Now with a car which has great speed and reliability, John aims to go further a field in 2018 to hopefully visit some closed road tarmac events. Shell:- 2004 MGZR with Safety Devices International weld in Cage, strengthened and seam welded. Engine:- Honda 1.6 B16 high compression bottom end with Weisco 12.5:1 Pistons, eagle rods, ground and polished crank, baffled sump. 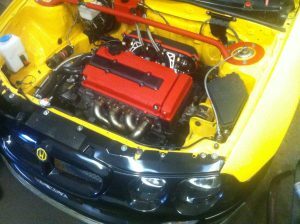 B16B flowed head with stage 2 cams, dual springs, high comp valves, titanium retainers. Titan Motorsport roller barrel throttle bodies, TurboSmart FPR 800 and EPS ASNU 430cc injectors. Fully built by AMW Motorsport. 220hp at 8900rpm. Gearbox:- AMW built S80 with Gear-X straight cut close ratio gears, 4:9 final drive, carbon synchros and KAAZ plate diff. Exhaust:- Bespoke tuned 4-1 equal length manifold and, centre section and rear pipe work by AMWmotorsport, using repackable 3rd party silencer. Suspension/brakes:- S1600 Ohlins 3 way suspension front and rear with Eibach springs (set for bumpy tar). AP racing 4 pots with 330mm Reyland bells and rotors. ZR160 rear brakes. Minted F4R pads. Interior:- bespoke AMW wiring loom, AIM digital dash, heated front screen, carbon interior, Motordrive seats and TRS Hans belts. Exterior:- S1600 spoiler, S1600 splitter, S1600 bonnet pod and corner pods, Rallytech Kevlar guards, carbon roof vent and mirrors.